Not knowing that he has a severe form of blood cancer, 11-year-old Osman Ali is now fighting for his life and awaits additional chemotherapy. His father, Rehmad, a daily wage farmer from rural West Bengal, has exhausted all he had for Osman’s treatments up till now. Now, Rehmad has nothing left to save his son and needs support. 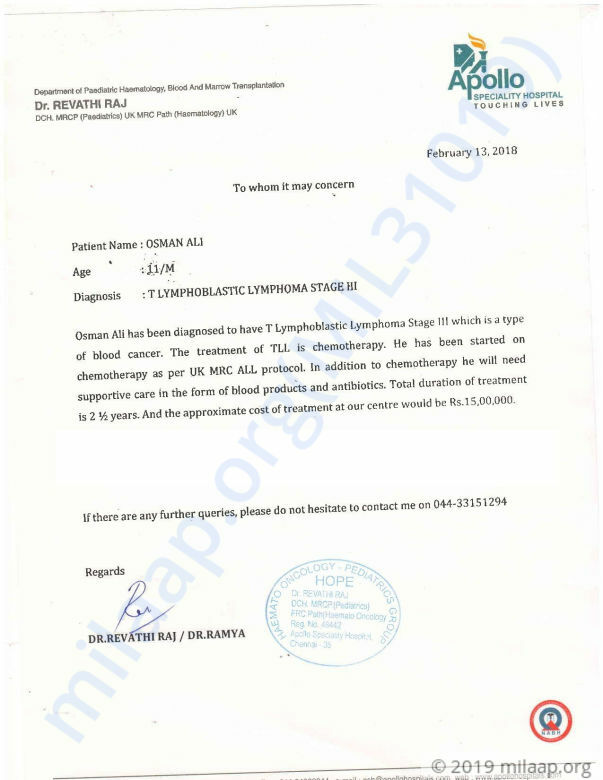 After chronic fever and chest pain forced Osman to get checked up, his life took a complete turn as he as he was diagnosed with T-Lymphoblastic Lymphoma, a type of blood cancer in it’s third stage. If untreated, this could spread quickly and would be fatal in just a matter of days. Residing in rural West Bengal, there was no good hospital near Osman’s village. His family was advised to go to Chennai. Being extremely poor, Osman’s father was unable to spend so much on short notice. 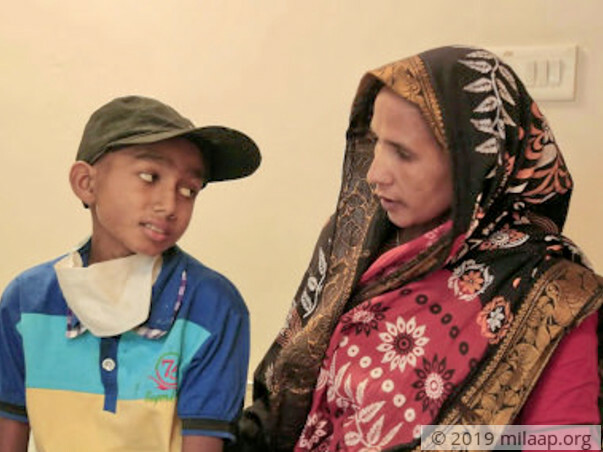 For two weeks, while Rehmad arranged for money, Osman was at home suffering from severe chest pain and lungs full of water. 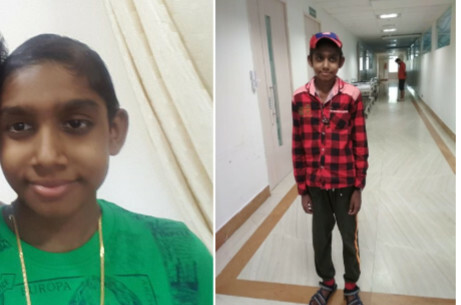 Along with his family, on January 1, 2018, the 11-year-old went all the way to Chennai for treatment. 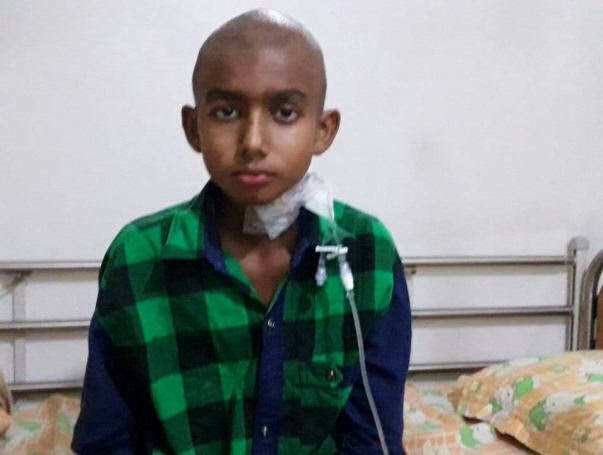 Now, in order to live, he urgently needs additional cycles of chemotherapy but after selling his farm and borrowing, his father has nothing left to save him. 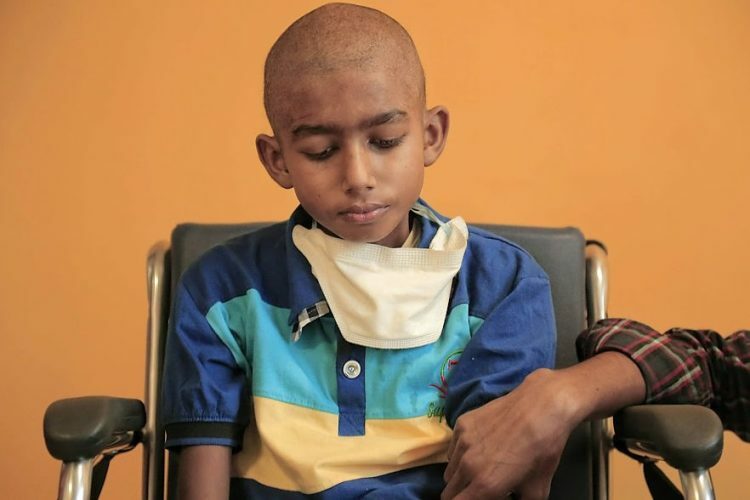 After going through the ordeal of moving to Chennai, Osman went through a month of high-dose chemotherapy. He doesn’t even know that he has cancer. Now, Osman needs to continue chemotherapy for the next few months at least and after that, he needs to get treated for an additional 2 years. Only then he’ll be able to survive. This is proving to be very challenging for Osman’s family who have spent literally everything they had in just a month at the hospital. Rehmad is an uneducated daily-wage farmer in rural West Bengal earning a meager sum of Rs 200 every day. To help his son, he sold his farm in addition to begging and borrowing from several villagers. 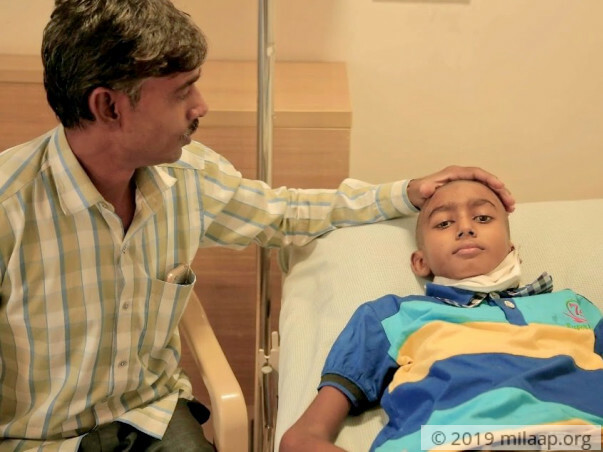 Till now, he has managed to provide Rs 3 lakhs for Osman’s treatment. 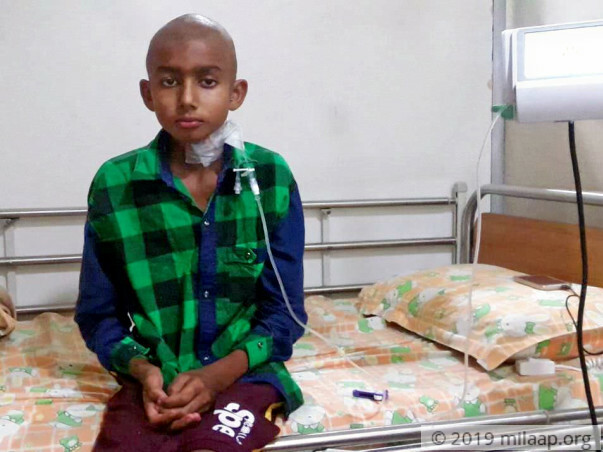 Osman, an 11-year-old who is suffering in pain due to cancer and rigorous chemotherapy, needs to continue treatment to survive. On top of that, he needs expensive medicines and blood products for the next 2 and a half years. Osman’s mother, Ambia, is a housewife and is uneducated too. The total cost of all of this is estimated to be around Rs.15 lakhs. His father has spent all he had within just a month of hospitalization. Now, he is running out of time to save his son and is left with no option but crowdfunding. Once a happy, active and school loving kid, 11-year-old Osman’s life has completely changed in a matter of days. He is has T-Lymphoblastic Lymphoma Stage 3 and is very critical. His hopes on survival lie on getting additional chemotherapy cycles but his father, a farmer, has absolutely nothing left to save him. Now, he needs your support to save his son. Your contribution will save 11-year-old Osman. Here is an update on Osman's health. Osman has truly had a second chance to live. He has made a miraculous recovery after acute pancreatitis and a major internal bleeding. He has completed all his intensive chemotherapy and is now ready to go back to his village on low dose chemotherapy for the next 2 years. His beautiful smile is a special gesture for all the donors who have helped him and he says that he and his family will include each and every donor in their daily prayers. Osman Ali has completed his induction and consolidation chemotherapy and is showing signs of improvement. He will need further treatment. We will keep you posted on his health. Currently, Osman is doing well and has responded well to the treatment. 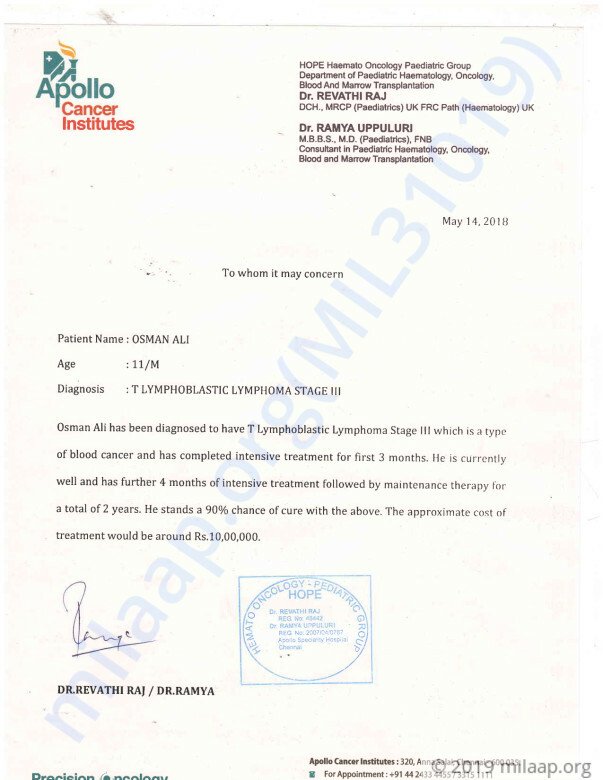 He has further 4 months of intensive treatment followed by maintenance therapy of total 2 years. There are 90% chances of complete recovery with the treatment. Request you to share this campaign with your friends and family.